Sending flowers to a loved one or a work colleague in hospital can be tricky, but at Code Bloom we know what flowers are the best to send and have sitting bedside. We have a selection of flowers and hampers that are perfect for these occasions, and we can always make something to suit an individual request. Code Bloom can deliver flowers and hampers to all of Perth’s hospitals 6 days a week. We deliver daily (excl Sun) to Sir Charles Gairdner Hospital, SJOG Subiaco, SJOG Mt Lawley, SJOG Murdoch and many other hospitals including Mount Hospital, Glengarry Private Hospital, Hollywood Hospital. 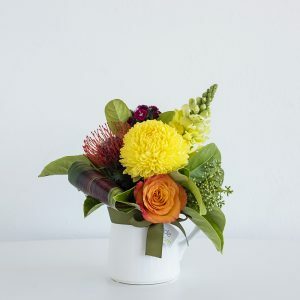 Our bright milk jug vase – especially cheerful and colourful this is perfect to sit bedside and suits male and females. Pink Calypso – a gorgeous long lasting tropical arrangement in a ceramic vase. Ruby in a vase – a beautiful mix of season pink and white blooms arranged into a vase. In addition to flowers we frequently make up “Get well soon hampers.” These are generally made to suit and could be as simple as a fruit hamper, or a savoury hamper, with any sort of additions that you would like whether that is magazines, puzzle books or a posy of flowers in there too. All our hampers come beautifully presented in either your choice of a hamper tray or a basket, wrapped in cello and ribboned to finish. Some hospital deliveries are cheerier than others! We all love making flowers welcoming a new addition to the world. Our two most popular baby flowers – our “It’s a Girl/Boy” packages that include a gorgeous toy and a helium balloon. We can also include a selection of baby products, gorgeous baby lotion or botty balm. If you are unsure of what to send or how to go about it just give us a call on 9444 8604 and we can talk you through the process and arrange for delivery with our flower courier. We are always happy to help!